NEW DELHI, Oct 13  The Punjab Government proposes to take tough measures and plug sales tax leakages to restore the fiscal balance in the state Budget. LUDHIANA, Oct 13  The large scale burning of paddy straw by the farmers in the fields is a major cause of concern to soil scientists of Punjab Agricultural University as it is not only adding substantially to air pollution, but is also depriving the soil of some major nutrients. WAGHA (Indo-Pak border), Oct 13  Amidst a maximum alert along the border, the gates on zero line at Wagha opened as usual with the hoisting of flags of the respective countries. BATHINDA, Oct 13  Teachers of various government and government-aided engineering colleges of Punjab are getting less pay than their own subordinates, including laboratory technicians. LUDHIANA, Oct 13  Twenty-eight new dengue cases have been reported from various city hospitals during the past 24 hours. PATIALA, Oct 13  University Grants Commission Chairman Hari Gautam today said that decisive measures were needed to curb inferior quality education for which a review of all institutions was necessary. CHANDIGARH, Oct 13  The District and Sessions Judge, Mr B.S. Bedi, today ordered the cancellation of bail of Mr L.S. Pabla, besides directing him to surrender in the court of Ilaqa Magistrate by October 15. GIDDERBAHA, (Muktsar), Oct 13  A murderous lust for land has landed one Gurdial Singh behind bars. CHANDIGARH, Oct 13  The Punjab Police chief, Mr Sarabjit Singh, has directed the district police chiefs and other senior officers concerned to check custodial violence. NEW DELHI, Oct 13 (UNI)  The Punjab Government proposes to take tough measures like stopping free rides by the Pepsu and state roadways buses, enhancing road tax on mini buses and plugging sales tax leakages to restore the fiscal balance in the state Budget. The state government may also increase charges for higher, technical and professional education,official sources said. The subsidy in the tertiary health care may also be reduced. Chief Minister Parkash Singh Badal is seeking advice of Planning Commission Member Montek Singh Ahluwalia and other fiscal management experts for preparing a blueprint for restoring the financial health of the state. Sources said that Mr Badal would follow a no-nonsense approach in increasing revenue of sales tax which as percentage of the state domestic product is merely 2.91 per cent in Punjab as against 4.86 per cent in Haryana, 4.36 per cent in Rajasthan and 6.13 per cent in Gujarat. As a fiscal health restoration step, the state government would even consider closure of public sector companies like Spinfed, Sugerfed, Punjab State Seed Corporation, Punjab Land Development and Reclamation Corporation, Punjab Tourism Development Corporation and Punjab State Tubewell Corporation in case these are not found viable. A committee under the chairmanship of Chief Secretary R.S. Mann is finalising its recommendations to deal with the firms. One of the main areas of concern for the state finance is high level of salaries. The salary bill for the state employees has gone up to Rs 310 crore per month from Rs 194.45 crore in 1996-97,mainly because of the implementation of the Central Pay Commission Report. Meanwhile, the Punjab government has suggested to the Centre the creation of a corpus of Rs 10,000 crore from which funds can be allocated to states for carrying out economic reforms. Mr Badal suggested that the allocation from this corpus should be over and above the normal procedure followed on the basis of the Gadgil formula. In the meeting with Mr Ahluwalia Mr Badal pointed out that the corpus would act as an incentive for the states to carry out economic reforms at a higher pace. Senior officials of the Punjab Government, who were present in the meeting, said that the Centre could allocate funds from this corpus for launching specific and credible reforms and related upfront action. Mr Badal pointed out that such a special window would not favour any state but rather could help more exhaustive economic reforms all over the country. The objective is to attract more foreign investment and bring about structural reforms in all states. Mr Badals meeting with Mr Pant and Dr Ahluwalia comes at a time when the state is reported to be going through a severe fiscal crisis. The Punjab Government is reported to be contemplating immediate and major policy initiatives for economic resurgence in the state. The initiative could involve concrete short term measures to rectify the fiscal imbalance as well as long term structural changes to suit the developmental priorities for the next couple of years. A detailed overview of the Punjab economy has been prepared identifying the target areas where immediate fiscal corrective are required. BATHINDA, Oct 13  Dr. Vineeta Gupta, Member, National Council, Peoples Union of Civil Liberties (PUCL) today said that the World Bank authorities were not satisfied with the functioning of Punjab Health System Corporation (PHSC). Addressing a press conference here, she said that during her meeting with Mr Tawhid Nawaz, Task Manager, World Bank in USA recently regarding the functioning of PHSC, he (Mr, Tawhid Nawaz) said the Punjab Government was not contributing its share of money for upgrading the health system under the World Bank scheme. The World Bank authorities might stop the payment of the next instalment of loan to PHSC if the Punjab Government did not clear its outstandings. The World Bank authorities had also been receiving flood of complaints of malpractices and irregularities in the PHSC. The world bank was supposed to give Rs 460 crores to the Punjab Government in six instalments starting from 1997 to 2002. Dr Vineeta Gupta, who held series of meetings with the human rights organisation in her two months professional attachment course sponsored by the Institute of International Education, a non-governmental organisation, said that she would research in the role of the state and World Bank in Punjab Health sector reforms in association with the New York based Centre for Economic and Social Rights (CESR). CHANDIGARH, Oct 13  The Punjab and Haryana High Court today directed the Advocate-General of Punjab to make a specific statement before the court about the steps the state government had taken to remedy the financial situation. Mr Justice G.S. Singhvi and Mr Justice M.S. Gill, who handed down the order, observed that they were constrained to take cognisance of the fact that dozens of petitions were being filed in their court every month with grievance by the employees of the state government and various statutory corporations and agencies of the government that they were not being paid salaries for months together. Petitions were also being filed by persons who had successfully completed the works pursuant to contracts awarded to them by the government, the Bench observed. Their grievance was that bills raised by them had remained unpaid. This situation required intervention by the court because "in our opinion such petitions are an unnecessary burden on the court." The issue of financial crunch in Punjab cropped before the court when a Jalandhar-based firm, Five Star Rubber Products, filed a writ, praying for a directive to the Punjab State Consumers' Redressal Commission to dispose of their appeal as expeditiously as possible. They had stated that their appeal about power connection was admitted but no actual date was granted. The petitioner-firm had also moved a separate application for dasti process since it was suffering an acute loss on account of the fact that the power connection had been disconnected. The state commission had, however, expressed its helplessness to give an actual date or to issue the process because of its acute financial constraints. JALANDHAR, Oct 13  While demanding fixing of minimum rational criteria for free power to farmers Sarb Hind Shiromani Akali Dal president Gurcharan Singh Tohra asked the state government to review the issue in all its aspect. Talking to mediapersons here today, Mr Tohra said that the Punjab Government should not withdraw its decision to give free power to farmers, but clarify whether free power to rich farmers should continue. He said there should be a minimum criteria of either land holding in acres or motor load in BHP for giving free power to farmers. He said, Mr Badal had failed to tackle the economic crisis and Punjab was the only state in north India facing a decline in revenue receipts. When asked about the Lok Sabha election results in the state, Mr Tohra said his intention was to ensure the defeat of inimical to the Akal Takht and he got it. We gave a defeating lesson to the Badal camp, Mr Tohra added. PATIALA, Oct 13  The Punsup Employees Union has decided to launch a struggle in protest against the state government's decision to withdraw certain allowances given to the employees of boards, corporations and co-operative bodies in the state. Mr V.N. Bhardwaj, General Secretary of the association, said the government had sent a circular in this regard to the department after which widespread resentment prevails among the employees. He said the withdrawal orders meant that employees will loose Rs 1500 per month. CHANDIGARH, Oct 12  Akali Dal (Badal) leaders who met me here for an introspection as how out why they lost the battle at the hustings, feel that the BJP has not helped their party. This issue directly, that is indirectly came up in all the meetings  district jathedars, private discussions and later in the Political Affairs Committee meeting. It was pointed out that for two reasons the urban voters base of the Bharatiya Janata Party in Punjab did not respond even to the call of Prime Minister Atal Behari Vajpayee. One, the performance of the BJP ministers has been poor, and second, the collection of octroi, which had been privatised, has alienated a large section of traders. Coupled with this was the poor living conditions added to the alienation. One senior minister here confided that voters, participation was in a way clear index. In urban area, the voters turnout fell to 41.34 per cent from 51.84 per cent in 1998. In semi-urban areas this was 57.13 per cent as against 59.21 per cent. Disenchantment was very much visible. The result, the BJP lost both in Amritsar and in Hoshiarpur and it barely managed in Gurdaspur. Here too the BJPs share fell from 56.36 per cent to 47.01 per cent. The margin of victory was some 1,200 votes for Mr Vinod Khanna against Mrs Sukhbans Kaur Bhinder. These were the Akali votes that got transferred to the which BJP brought about this victory, the minister explained. The BJPs share in total fell from 11.67 per cent to 9.15 per cent. The highest drop of 13.21 per cent also formulate its own strategy so that the urban areas would respond directly to the Akali Dal. Urbanites, particularly Hindus, in major cities and urban centres, except in some mandis of Malwa, had not liked the Akali Government. There is a clear shift to the Congress, which increased its share of votes from 25.85 per cent to 38.44 per cent and, thereby translated this into victory from zero to eight for itself and another one for the CPI. Asked whether the Akali Dal will revise its alliance with the BJP, a senior party functionary said there was no question of this happening at this juncture. But it is clear that the BJP would be of little help in any future election unless quick and long-term corrective measures are undertaken. The Food Minister, Mr Madan Mohan Mittal, has already stated that such hard measures are the in the offing. Many Akali leaders assert that the share of Akali voters has not gone down  its base among the Sikh peasants is intact. First rural voters turnout has increased from 61.95 per cent of 66.47 per cent. As to why the Akali Dals own share was down from 32.93 per cent to 28.59, the minister said it was largely due to the fall in the share of Hindu votes, the BJPs bastion. Of course, we lost some share to the Tohra camp, but this is marginal as against what we lost to due to the BJPs poor showing, the emphasised. As an example of this, another Akali leader said take Ropar, a reserved constituency with a dozen-odd well-populated mandi towns, the Akali Dals share fell from 53.83 per cent to 35.03 per cent  down by 18.8 per cent. He admitted that Tohra factor was there and so was the anti-incumbency factor, but the Hindus just did not vote for the Akali candidate, he felt. 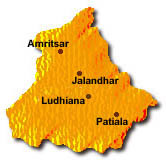 Akali share fell by 13.47 per cent in Ludhiana, 14.98 per cent in Patiala. 10.03 per cent in Sangrur, 12.01 per cent in Bathinda, 3.56 per cent in Faridkot, 12.46 per cent in Ferozepore and by 8.76 per cent in Tarn Taran. These two seats were won by the Akalis. This elections BSP factor really blurs the picture. The party once contested along with the Akali Dal and bagged three Lok Sabha seats. Later it joined hands with the Congress and won one seat. This time it was an ally of the Akali Dal (Tohra) but drew blank. Much of its base where the party did not contest shifted to the Congress where once it belonged. It is also not clear how much Sikh peasantry shifted to the Congress. But there was some shift. CHANDIGARH, Oct 13  Mr Charanjit Singh Channi, who has been elected a member of the Lok Sabha from the Hoshiarpur constituency in the recently held Lok Sabha poll, has resigned as an MLA. Official sources said the Punjab Speaker, Mr Charanjit Singh Atwal, has accepted the resignation of Mr Channi, and a notification in this regard had been issued. Mr Channi was elected as the MLA from the Nawanshahr Assembly constituency in 1997. He was put up as the Congress party nominee from Hoshiarpur in the Lok Sabha election. He won by defeating Mr Kamal Chowdhary, a BJP candidate. As the Nawanshahr Vidhan Sabha constituency has become vacant following the resignation by Mr Channi. A byelection will have to be held to fill the vacancy. CHANDIGARH, Oct 13  A meeting of the district jathedars and working committee of the Sarb Hind Shiromani Akali Dal will be held in Ludhiana on October 23, according to a press note issued here today by the party's general secretary, Mr Prem Singh Chandumajra. The post-election scenario obtaining in the state and the country will be discussed at the meeting. According to the figures available from the Department of Soils, Punjab Agricultural University, around 3507 kg/hectare of paddy is produced on the 2.44 lakh hectare area of land under rice paddy. This process leaves some 188 lakh tonnes of residue (husk and straw) of which 142 lakh tonnes of straw is burnt annually at this time of the year. Paddy straw which contains 0.5 per cent nitrogen, 0.15 per cent phosphorous, 2.5 per cent potassium and other micro nutrients, if reincorporated in the soil, could substitute for most 60 per cent of the total nutrient consumed during the kharif season. Instead 3.51 lakh tonnes of nutrients in rice straw and husk are completely or partially lost. Interestingly, Dr Veraj Beri, a soil scientist says its farmers with large land holdings who are burning paddy straw instead of ploughing it in. He said these farmers used mechanical combines or shredders for harvesting the rice grains. As a result straw left over in the fields is burnt to the ground. The economics of incorporating rice residue into the field, while it is not beneficial in the short run. Farmers with marginal and small land holdings harvest the rice crop manually and instead of burning the residues, use them animal bedding, construction of roof thatches etc. Since labour is required to incorporate this residue in the soil these farmers, too, do not accept this practice. Interestingly various studies have been conducted which have proved that rice straw, if ploughed in the soil three to four weeks before sowing of the wheat crop and with the normal nitrogen fertiliser applied on the fields, increases grain yield within two to three years of the adoption of this practice between one to three quintals per hectare. Says Dr N.S. Pasricha, Professor and Head Department of Soils. PAU, besides having a favourable effect on the yield of wheat in the rice-wheat rotation the incorporation of rice residue in the soil also has a good effect on soil properties including PH balance, organic carbon, water holding capacity and bulk density of the soil which too has a bearing on yield. The burning of straw also causes environmental pollution as happened on October 15,1998 when thick black smog enveloped large parts of the state. The burning of rice residues decreases the efficiency of some herbicides used for controlling weeds in wheat. However, scientists agree that various alternatives for using the rice residue have not proved beneficial. The straw cannot be used as dry fodder for animals because of its high silica content. For the same reason it cannot be used in the paper and cardboard industry. Though the buses from Lahore and Delhi reached Wagha in the morning and evening respectively there is a big question mark over whether the bus service will continue. However, Pakistani passengers arriving from Lahore at 8.10 a.m. were clearly happy that the government of Mr Nawaz Sharif had been toppled by the Army. He betrayed the countrymen on Kargil issue, one of the passengers said. Mr Sharif should not have sent militants into Kargil. And if he had, he should not have then appealed to them to come back. Such a double policy was a cause for humiliation for the entire nation, they said. The 32 passengers from Pakistan who reached Wagha at 8.10 a.m. included 11 Indians and one foreigner from Morocco. 38 passengers crossed over to Pakistan through Wagha on the Delhi  Lahore bus, including 13 Indians and five foreigners. Pakistani nationals Mohammad Iqbal and Nafisa Begum from Lahore said that due to the ill-governance of Mr Nawaz Sharif, the country had become bankrupt and corruption had surpassed all previous records under the rule of Mr Sharif. They hoped that the economy of the country, caught in an unprecedented debt trap, would improve under army rule. However, they said army rule should be replaced by a democratically elected government in the near future. The Indian passengers, Ansar Ahmed and Sarfaz Ahmed, said that they were happy that they had returned safe and sound after the army coup. Indian and Pakistani passengers Sadika Begham and Sazid Zamil (Pakistani) and Chunna and Shanno (Indians) who crossed over to Pakistan at 4.15 p.m. said that the Delhi-Lahore bus service should not be stopped. Most Pakistani passengers entering India said the road traffic was unlikely to be affected between the two countries as army coups were not new to Pakistan. By contrast the news of Mr Nawaz Sharifs dismissal was met with dismay in Jatti Umbra, Mr Sharifs ancestral village. AMRITSAR, Oct 13  The wresting of power by the army in Pakistan is likely to force the SGPC administration to drop its plan to send a jatha of 3000 pilgrims to visit Sikh shrines in that country on the occasion of the birth anniversary of Guru Nanak in November. This was hinted at by SGPC secretary, Mr Kulwant Singh, in a talk to TNS while referring to the impact of the change of power in Pakistan in a sudden coup on Tuesday. It is uncertain whether the body will be able to sponsor the jatha in such a short period of time as the formalities are still to be completed. The Punjab and Indian Government is yet to ask for list of the pilgrims which in the normal course should have been sent by now. Mr Kulwant Singh added that the body, however, had already asked the intending pilgrims to send their passports to the SGPC office at the earliest. The status of the visit will depend on the situation in Pakistan and its future policy towards India as the government might be hostile towards India. The secretary stated that the intended visit of the ten-member delegation to sort out the controversy arising out of formation of the PGPC by Mr Nawaz Sharif regime was still hanging fire as clearance from the Governments of India and Pakistan has not been received. The delegation was to be led by the new SGPC president, Bibi Jagir Kaur. The names of the delegates had already been forwarded to the External Affairs Ministry for clearance, he added. After failing to get any positive response from the authorities concerned towards their representations made in connection with the implemention of the revised pay scales, the members of various engineering college teachers associations are contemplating to take a legal recourse to get their dues. Mr Raja Singh Khela, President, Giani Zail Singh College of Engineering and Technical Teachers Association, in a press note issued here today said all associations would meet at Fatehgarh Sahib on October 23 to evolve a strategy to get the revised pay scales implemented. He pointed out that the teachers working at Regional Engineering College and SLIET, Longowal, were getting revised pay scales while the same had been denied to the teaching faculty of other colleges of Punjab. The revised pay scales were due to take effect from January 1, 1996. Due to its non-implementation, a lecturer was suffering a loss of more than Rs 40,000 annually and a professor that of Rs 1,10,000. He alleged that the Punjab Government and the AICTE, Delhi, had not redressed their problem despite a number of representations in this regard. He claimed that due to this callous attitude of the government, some of the teachers were joining other services where they were being offered more pay. LUDHIANA, Oct 13  Twentyeight new dengue cases have been reported from various city hospitals during the past 24 hours. Of these, 18 have been reported from Christian Medical College and Hospital, seven from Dayanand Medical College and three from Bhagwan Ram Charitable Hospital. The figures available from the Civil Surgeons office have confirmed 233 dengue cases in the city so far and 19 of these are from outside. The number of suspected cases has been 165 and 78 of these have been outside Ludhiana. Meanwhile, a meeting of the in charges of nursing homes and general practitioners from various localities of the city was called by the Civil Surgeon, Dr Rajinder Kaur, here last evening. It was learnt that they were instructed to report all dengue cases coming to them either at the dengue control room at the CMC or to either of the three mobile squads on the cellular phones being provided to them. These mobile teams would then visit all houses in the affected locality and take platelet counts for the residents. During the meeting, instructions were also given that the doctors should refer the cases to either the DMC, the CMC or the Civil Hospital. If the platelet count of a patient fell below 50,000 per CC of blood, he or she would be asked to educate people on preventive measures and create awareness about dengue in their respective areas. PATIALA, Oct 13  University Grants Commission (UGC) Chairman Hari Gautam today said that decisive measures were needed to curb inferior quality education for which a review of all institutions was necessary. Delivering the convocation address at the Thapar Institute of Engineering and Technology here, he said following review, institutions which did not deserve to exist could be closed. The UGC Chairman said some fundamental changes were also necessary in the planning and organisation of engineering education. He said the mushrooming of engineering colleges had resulted in institutions which did not have the required infrastructure or faculty profile. Dr Gautam said special courses with a committed intake designed for industries could also help develop relevant human resource. The training and retraining of engineers could also be ensured through such linkages. Academic-industry linkage had become a vital link which could no longer be ignored. The corporate sector had universally recognised the importance of quality in their products and services for achieving and sustaining competitiveness, he said. He said a teacher at an engineering institution should work on research and development on industrial consultancy. He said the lead times in case of engineering education were long and unless planning was done for the future there could not be worthwhile results. He said the dons must also recognise the need for assessment of skills, aptitudes and knowledge requirements of industries and organisations which recruited their students. The orders were passed on a revision petition filed by Mr Jarnail Singh Goggi, a theatre artist, against the orders of Mrs Paramvir Nijjar, Judicial Magistrate First Class, for remanding Pabla in judicial custody instead of police custody in a case registered against him under sections 406, 420, 465, 468 and 471 of the Indian penal code at the sector 36 police station. The petitioner argued that Pabla after being remanded in judicial custody by the Ilaqa Magistrate had been granted bail improperly. The petitioner maintained that he had been working with L.S. Pabla as a theatre artist and staging religious plays in the USA and Canada. An agreement to this effect was signed between the petitioner and L.S. Pabla on March 26,1995. The complainant along with his team visited various places in North America between 1995 and 1998 and staged religious plays. A dispute arose between the complainant and L.S. Pabla over payment. L.S. Pabla had to pay Rs 10.63 lakh to the complainant. Instead, the complainant said, a false complaint was filed against the complainant. The complainant said he was also relieved of his passport on the pretext that L.S. Pabla would get him visa for New Zealand and Italy. Another passport belonging to Mr Parveen Sethi and another member of the troupe was also taken by L.S. Pabla, who also borrowed Sumo vehicle from the complainant for three days but did not return despite many reminders. After hearing the arguments, Mr Bedi observed that bail order had been improperly passed by the Ilaqa Magistrate and it was a fit case for passing orders under Section 439(2), Cr P.C. that L.S. Pabla be arrested and committed to custody. Police sources said Gurdial Singh in a conspiracy with Hardev Singh, a cousion of his father Billu Singh mixed insecticide in the food of his uncle Darshan Singh on September 23, 1999. Darshan Singh died in hospital hours later. They then took his body back to the village without getting a post mortem done and spread the news that Darshan Singh had died after inhaling insecticide while spraying it on his cotton crop. However their story aroused suspicion and DSP, Ashok Baath started to probe the death. Talking to TNS Mr Baath said investigations into the case revealed that Darshan Singh, was to have married in two days. Gurdial Singh, who coveted his land decided to kill him and grab the land before he married. After consuming the poisonous food, Darshan Singh had gone to his brother, Beera Singh and then to Ajaib Singh, husband of the female sarpanch of Kotbhai village, to tell him that he had been poisoned. Darshan Singh was taken to private hospital in Gidderbaha by his brother, Beera Singh where he died the same night. Later his brother Billu Singh and nephew Gurdial Singh brought the body back and cremated it the next day. Mr Baath said that during investigations it was established on the day of the incident the deceased had picked cotton and not sprayed insecticide, as was being claimed by the accused. He said the accused had also planned to kill Beera Singh and grab his land was well. He said that a case under 302, 201, 34 and 120-B of IPC had been registered and investigations were on. AMRITSAR, Oct 13  An Assistant Sub-Inspector Gurnam Singh was arrested when he opened fire on one Balbir Singh, an architect at the marriage of the son of a farmer here today. The victim died on the spot. The B division police arrested the ASI under Section 304 of Indian Penal Code. The tragedy occurred at Prince International near Sultanwind road. The alleged culprit was reportedly under influence of liquor. CHANDIGARH, Oct 13  The Punjab Government has taken steps to ensure adequate availability of DAP fertiliser in the state for the current rabi sowing season. Mr Y.S. Ratra, Financial Commissioner (Development) said nearly 4.20 lakh tonne of fertiliser would be required for the rabi sowing season and of this 2.20 lakh tonnes would be arranged for sale by Markfed and Punjab Agro and the rest by IFFCO and the private trade. He said already 2.42 lakh tonnes of fertiliser had been procured by the agencies concerned for sale and 46,000 tonnes were on the way to Punjab and 94,000 tonnes were being loaded at the supply end. Mr Ratra claimed that there would be no shortage of fertiliser at any stage and the availability of DAP fertiliser would be satisfactory. He said that aberrations on the part of a few police officials reduced all the good work done by the force almost to nought. Recently, The Tribune in its columns has highlighted the cases of custodial deaths and violence and growing resentment among the people against such conduct of the police. The police chief said while inspecting or visiting police stations, gazetted officers should ensure that nobody without proper record was kept in the police station. All those present in the police stations should be questioned about the reasons of their presence and the treatment they got there. Police officers have been told to be available to the people and take prompt action on complaints received from the public. It has been made clear to all concerned that any custodial death or violence would be viewed seriously and action taken against the supervisory officers along with those involved in such cases.